Glass is a timeless, sleek, and modern material that makes for a gorgeous chess set. Here are some of the best. 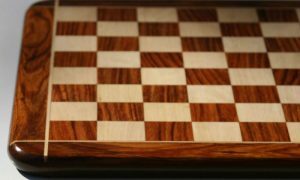 Obviously, glass can be a bit more fragile than other types of chess sets, so you’ll want to consider if the material is appropriate for the way you intend to use the chess set. For example, it would be a fine choice for a decorative set or one for use in a study or other adults-only area. However, if you’re looking for a travel chess set, or a set for a young child, glass is probably not the best choice. You’ll need to treat it more gently than other types of chess sets to ensure that it doesn’t break. As we’ve said, glass is a very versatile material, and glass chess sets can be made to suit any style or design preference. That means that you’ll have a lot of options to choose from when buying a glass chess set! To narrow things down, decide whether you have a strong preference on style before you start shopping. If you know you really want a modern looking set, there’s no use wasting time looking at more traditional styles! Of course, price is a factor in any purchase. Glass chess sets can range in price from extremely affordable, beginner friendly sets all the way up to designer crystal chess set. Know what price point you’re most comfortable with before you start shopping to avoid getting your heart set on something that you just can’t afford. 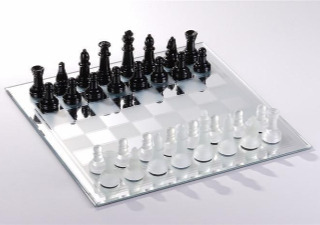 While most of the glass sets on this list have been more of a modern style in one way or another, The Black and White Mirror Board Chess Set is a fine example of a traditional chess set made from glass. This is the set you probably picture in your head whenever someone mentions a “glass chess set”. It features simple black and white chess pieces with familiar shapes on a similarly simple chessboard. Now, just because the pieces are so simplistic doesn’t mean that they’re not beautiful. In fact, this black and white set is one of the most beautiful glass chess sets on this list just because of how well executed the simple design is. There are no frills or gimmicks to distract you, this is just a high quality, traditional glass chess set. The pieces in this set are classic shapes in either black or frosted clear glass. The King is 3 inches tall, and each piece features a felted bottom to prevent scratching and other wear and tear on the chessboard. The chessboard is made from mirrored glass with a frosted glass overlay. The frosted glass squares represent White, while the mirrored squares represent Black. The perimeter is a sophisticated beveled edge. 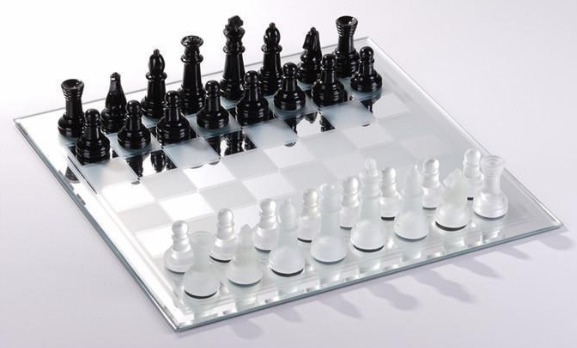 The Black & White Mirror Board Chess Set would make a great gift for a chess player with an eye for the traditional, with just a small unique twist to keep things interesting. It is also a very affordable introductory glass chess set for a beginner that will last you for years to come, never going out of style. All of your friends and coworkers will be impressed by the simplicity and timeless elegance of this traditional glass chess set. It’s just as beautiful now in 2019 as it was 50 years ago, and 50 years from now it will be just as beautiful still! 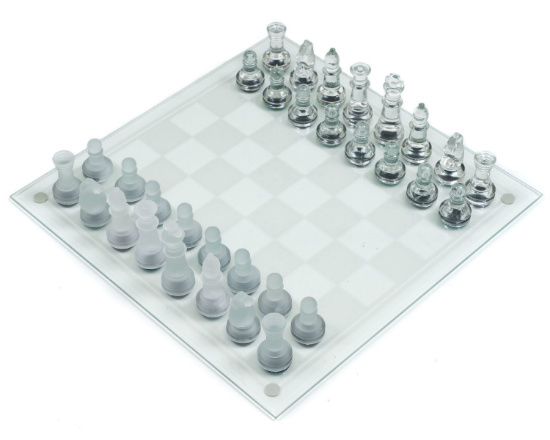 One of the simplest glass chess sets on the market today, this is a very basic glass chess set that comes at a very affordable price. The quality is not the best, but for the low price, it’s still a pretty good value for the money. 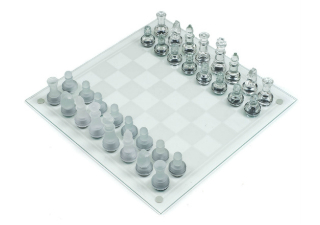 The Classic Games Glass Chess and Checkers Set features a glass chessboard with alternating clear glass and frosted glass squares, as well as clear glass and frosted glass chess pieces. This effect gives one set of chess pieces a glossy, smooth look while the other looks and feels more matte. Overall, this glass chess set is workable, but it’s nothing to write home about. The pieces are not incredibly detailed, and the quality overall is just not the best. You get what you pay for in that regard, but if you have a very small budget to work with, this set will get the job done. If you can afford it, though, we recommend raising the budget a little bit and springing for something a bit better. After all, crystal chess sets are used mainly for display purposes and as a way of beautifying a room, so you may as well spend a little bit extra up front to get a more beautiful, high quality product. If you have any wiggle room at all when it comes to price, you won’t regret springing for a slightly more expensive glass chess set like some of the others on this list. These 3D glass chess sets come in a variety of styles based around different themes. There is one for dragon lovers, another for Roman gladiator fans, and a third featuring Medieval Knights, so you can choose whichever tickles your fancy. 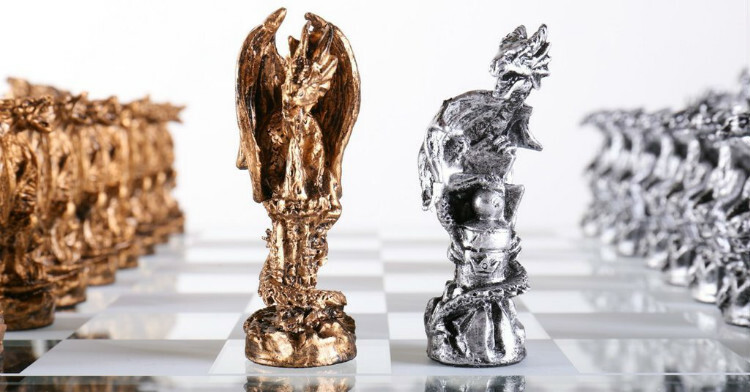 All of the products in The 3D Battle Chess Sets Series feature outstanding design with mixed metal and glass construction. In each set, the glass chess board is suspended over the battlefield below, seeming to float in midair as you wage war on its surface. During the game, you can see through the glass chess board to the sculpted battleground below, which adds extra ambience. The 3D Battle Chess Sets Series definitely add a little spice to the mix that many other glass chess sets simply don’t have. The addition of the 3D metal board base and the shiny metal pieces certainly sets it apart from any other crystal chess set. Of course, if you want to tone it down a bit, the glass chess board can be removed from the metal stand and used on any flat surface as normal. The beauty of these glass chess sets is unparalleled, and they are certainly worth every penny of their price. 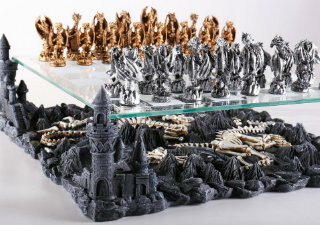 The detailed chess pieces and 3D battlefield board bases take them from a game board to a work of art and add an extra element of fantasy to every chess game you play on them. It’s easy to imagine you’re a Roman gladiator facing off against an opponent when the entire Colosseum is laid out before you! 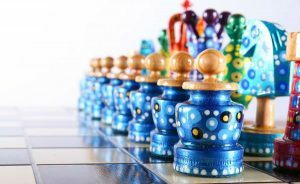 Glass chess sets are some of the most innovative and modern chess sets on the market in 2019, but gorgeous and traditional glass chess sets are available for sale as well. If you want to really push the envelope with your chess set and get something extremely artistic and unique, glass chess sets can offer you that, but they can just as well offer something timelessly elegant with a classic style. This versatility makes shopping for a glass chess set a daunting endeavor. With so many extremely different sets to choose from, how can you be sure which is the perfect fit for you? Well, there are a few tips you can use to help keep you from getting overwhelmed. Maybe you are open to whatever style of glass chess set speaks to you and you want to look at them all. In that case, more power to you, though it will certainly take quite a while to see all that there is to see. More likely, though, you feel yourself drawn to a particular style or styles over all others. Maybe you really prefer something with a traditional style, a chess set that looks like the ones you’re used to seeing growing up. Or, maybe you prefer something with a totally off the wall design, something that visitors to your home may not even recognize as a chess set like shot glass chess set or Swarovsky crystal chess set. Maybe you’re somewhere in between those two extremes. 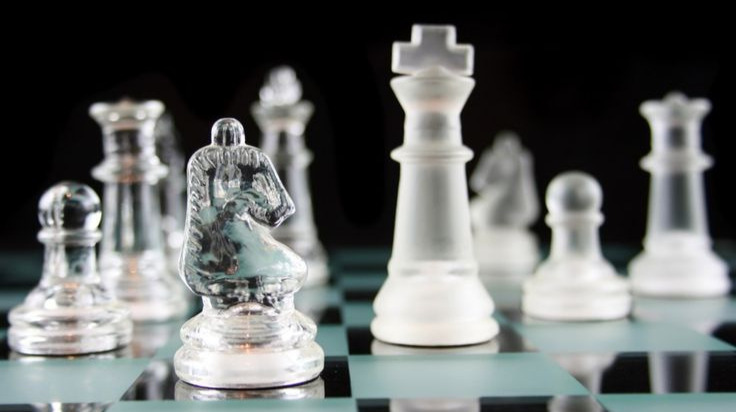 Whatever style you’re after, it can be found in a glass chess set, but narrowing down your search parameters to only that specific style will shorten the process by a lot and make sure you’re only seeing chess sets that are well suited to you. 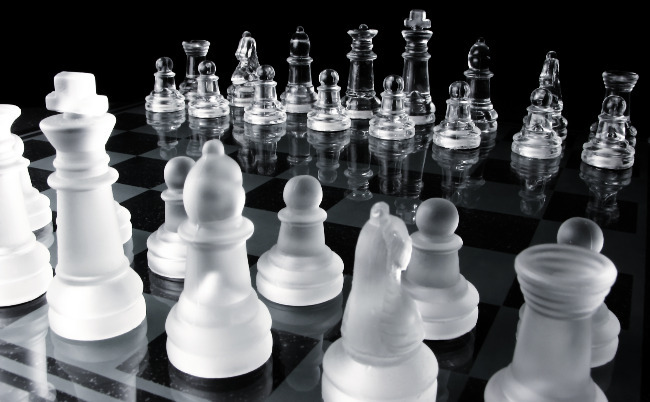 If you are a power player that’s constantly at the chessboard, traveling for tournaments, and studying chess problems, a large glass chess set may not be able to stand up to the rigor of your play. We certainly wouldn’t recommend a crystal chess set as a primary traveling set as the pieces are just too fragile and would be easily broken in transit. A crystal chess set with glass board is best for staying in one place, at home, and under light to normal use, rather than heavy use. Glass chess sets are also not appropriate for young children, who may easily break the pieces and could hurt themselves on the resulting glass shards. Glass chess sets are best for adult use in a stationary location, so make sure that’s how you intend to use your chess set before you buy one. List of The Best Chess Sets: Our Reviews List of The Best Chess Sets on the Market. 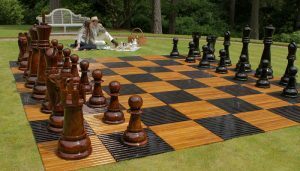 Luxury Chess Sets: List of The Best Luxury Chess Sets on the Market. Shot Glass Chess Set Review: Shot Glass Chess Set – Your New Favorite Drinking Game! 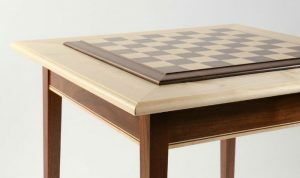 Ivory Bone Chess Set: List of The Best Ivory Chess Sets of 2019. 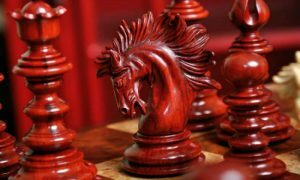 Cool and Unique Chess Set Reviews: Reviews List of The Coolest And Most Unique Chess Sets Online. 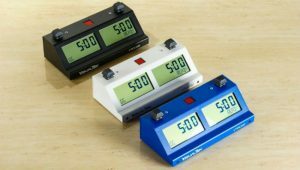 Magnetic Chess Sets: List of The Best Magnetic Chess Sets of 2019. Contemporary Chess Sets: List of The Best Modern Chess Sets for Sale Online. The Batman Chess Set: List of The Best Batman Chess Sets of 2019. 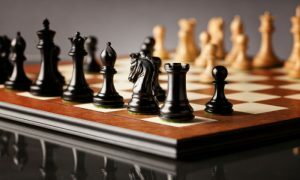 The Best Medieval Chess Set: List of The Best Medieval Chess Sets of 2019.